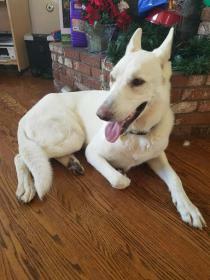 Hey there sadly I am in need of finding my 5 year old male White German Shepherd named Krypto (like the super dog) a new home or rescue. He is a beautiful dog and a pleasure to be around, but he has a pretty bad case of separation anxiety and after 4 months the place I rent at has had enough of his separation anxiety behavior. I have tried over the past 4 months to train and work with his separation anxiety but to no real headway. now I know it can take a long time to get past this and I would love to continue doing so but the rest of the people are at the end of their patience. Now other than the separation anxiety he is a very good dog, he is playful and energetic. And has some training, he knows sit, stay, shake and lay down, he even knows to do these things and wait for your command to eat his food. 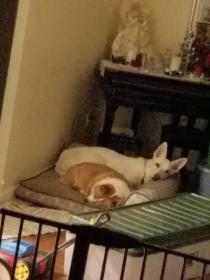 he does well with other dogs as we have a corgi also in the house and they get along well, his previous owner had a cat and said he was good with him but we never saw It so I can not say for sure. there is also a 4 year old kid in the house and he is good with him as well. I don't want to get rid of him but am kind of in a bad spot with his situation and need to sadly so thank you for any help received. I realize I forgot to put some info, I am located in Moreno Valley California down in Riverside County in So Cal. oops. What separation behaviours exactly? Your dog is old enough for a bark collar, have you tried that? If he poops/chews, maybe put him in a crate? And if his poop smells maybe open the window and buy scent diffuser? Those are the only complaints I have received regarding my dog's separation anxiety. I can't use bark collar on her as she is a bit too young and already reactive, but I think your dog should be fine. Also you can try giving him real bones to chew on when you leave. It takes time but it can get better. His separation anxiety will likely get even worse if he is rehomed. Have you tried RESCUE ? in terms of behavior it is mostly consistent whining an whimpering throughout the time he is separated from me even if I am just in the next room on the other side of the baby gate. he also has started to develop habits of escaping like clawing at out sliding door to out kitchen till he gets it open or biting the baby gate handle until he get s the angle just right and opens it. for putting him in a kennel the previous owner said he was trained but he clearly wasn't fully as he whines loudly inside it and claws bites and scratches his crate moving it across the room and even biting chucks and whole into the crate. all the rescues in my area are full I've tried them and so are most shelters. and the problem is that at this time the owners of the house no longer want me to have him at the house so I pretty much have to get rid of him, no fixing it they want him gone. I would love to work with him and try new things to help him with the separation anxiety but its too late pretty much. Try Adaptil, available at Petsmart. They have several different products but I used the diffuser very successfully with my boy way back when. Stopped his separation anxiety (whining) cold. Its a synthetic copy of the pheromone mothers emit when the dogs are pups. Its colorless, odorless and you plug it into a wall outlet in his area. Easy fix that's worth a try. Been awhile since I had to buy it but I remember it being under $50. yeah I wish I could try even some drugs or supplements to help but like I said owners want him gone no real way to change their minds sadly. yeah we have no complaints from neighbors or anything luckily but the people in our house it self are the ones complaining. and I definitely don't want too but yeah got to, and I looked into them but thought they might be too far away but I just decided to send them an email about it and see what happens thanks so much.